A Rare and Historic Opportunity for America to Finally Get It Right! Our “GoFundMe” goal of a minimum $50, 000 is to produce our television Pilot to show potential investors what this all-inclusive national cable news television network will look like, Be they a large group of small investors or big money venture capitalist, once the Pilot is complete with paid for major corporations advertising, it will validate it is a viable business concept and a great investment opportunity. All-inclusive is the key, meaning we will not marginalize or limit ourselves by being a black national television news media version of Jet, Ebony or BET. All-inclusive means we will cover and report on the same national and international newsworthy events as the other major news organizations but include what they have been omitting, which is the issues interests and concerns of black Americans, and the ability to impose accountability where it has never been. This gives us a competitive advantage over the other news organizations in being more informative and comprehensive in our reporting. This is the all-inclusive national news media operation America has needed and been waiting for. The integration of law enforcement and the news media has many in the nation thinking racial news media bias is a thing of the past. A classic refutation of that notion is in “The Big Cover-Up” video we produced, which goes right to the root of the problem, exposing how the integrated press has an updated tradition and practice of not only deferring to law enforcement in race matters but knowingly covering up police misconduct when race is involved. 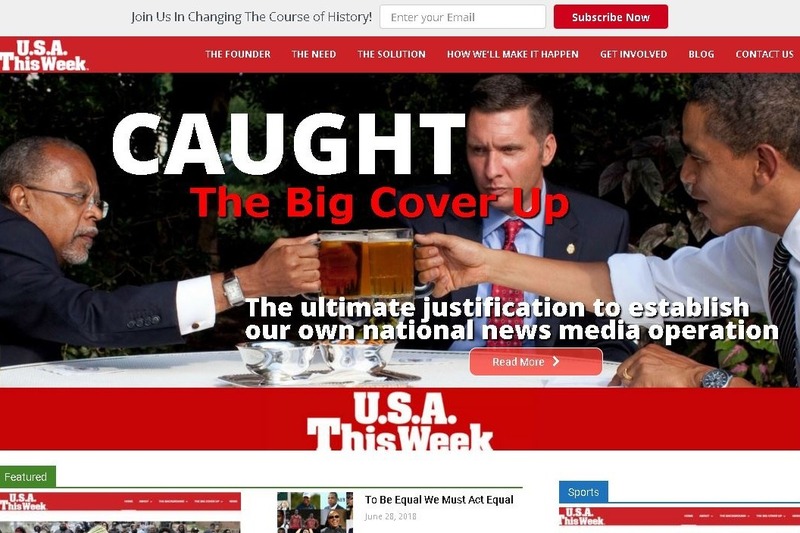 The video features President Obama, the black man at the top of the food chain, being subjected to this police and press collusion, showing no black American is exempt from this press and police complicity. It shows having our own all-inclusive national cable new television network to expose these racist practices will deter these racial injustices that have depended on the lack of exposure and accountability for their existence. While this police and press complicity doesn’t occur in every instance, it’s often enough to show it’s as real a tradition and practice in the news media as the code of silence is in law enforcement. This obvious solution of establishing our own all-inclusive national news media operation only needs widespread exposure of these little known but major racist revelations to gain the necessary support to make it happen. We believe “GoFundMe” is ideal in providing a sizable audience of concerned Americans who will support this endeavor once being made aware of these widely embraced misleading racial misperceptions, their resulting injustices, and this obvious solution, we are implementing, all of which we document in “The Big Cover-Up ” video. 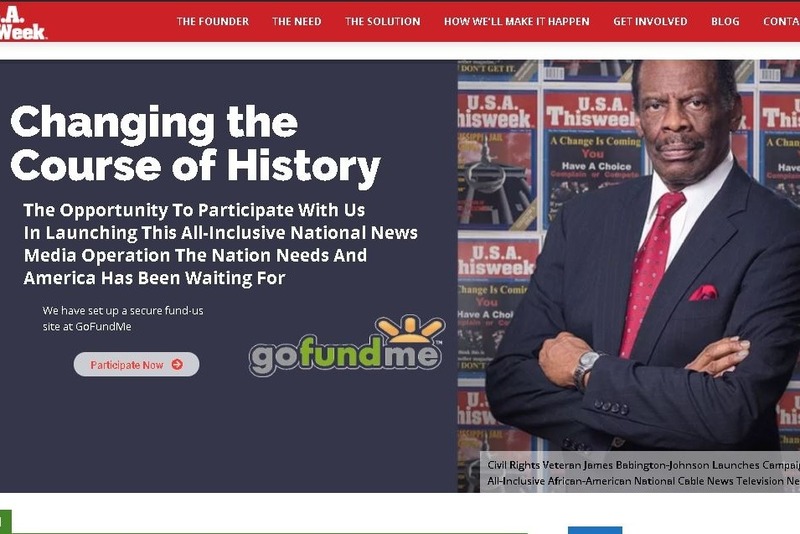 Our “GoFundMe” campaign supported by our informative www.usathisweek.com website , and promoted by our social media campaign, gives us this rare opportunity to fix this longstanding fundamental racial news media inequality problem. Our “GoFundMe” $50,000 goal is necessary to produce our television news day pilot presenting this awareness-raising enlightened missing editorial perspective is a given as demonstrated by our “The Big Cover-Up” video. The pilot will be 60 minutes in length. Ideally, there will be five ten minute segments, budget permitting. Each segment will be hosted by five different on-air Journalists to include two or three guest experts or commentators per segment and remote location reporters covering on-site aspects of the story featured with each segment. The pilot is to justify raising millions from investors to launch the actual national cable news television network. “How We'll Make It Happen” is explained (raise millions from a million investors) on our website. Each Segment calls for its unique set design. Even with mock-up background façades set design, construction will run minimum $2,000 per set. Other expenses for 5 segments everything is a multiple of five. ( 5 x 5) other than a single studio rental. Each segment will have a host and 3 to 5 guest experts or reporters. Each segment will have a producer, a director, and a writer, and at least 3 cameramen. There must be a minimum of 3 camera angles. Other expenses include travel equipment rental video editing miscellaneous. Seasons greeting to all. We have been assured contributions will surge at the beginning of the year. January 2019 begins our social media campaign to promote this GoFundMe campaign. This all-inclusive national news media concept only needs exposure and understanding to gain the necessary support. 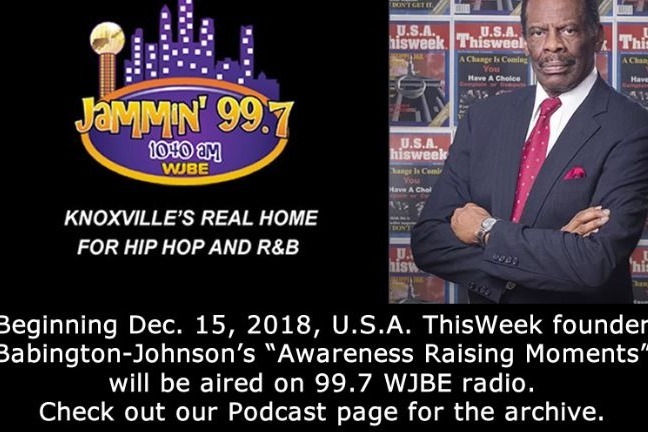 Twitter, Instagram, Linkedin and Facebook will be utilized to promote this empowering concept in addition to our “Babington-Johnson Awareness Raising Moments,” which are now airing daily on WJBE 99.7 in Knoxville Tennessee. The “Moments” are also on our website www.usathisweek.com click on the menu bar.